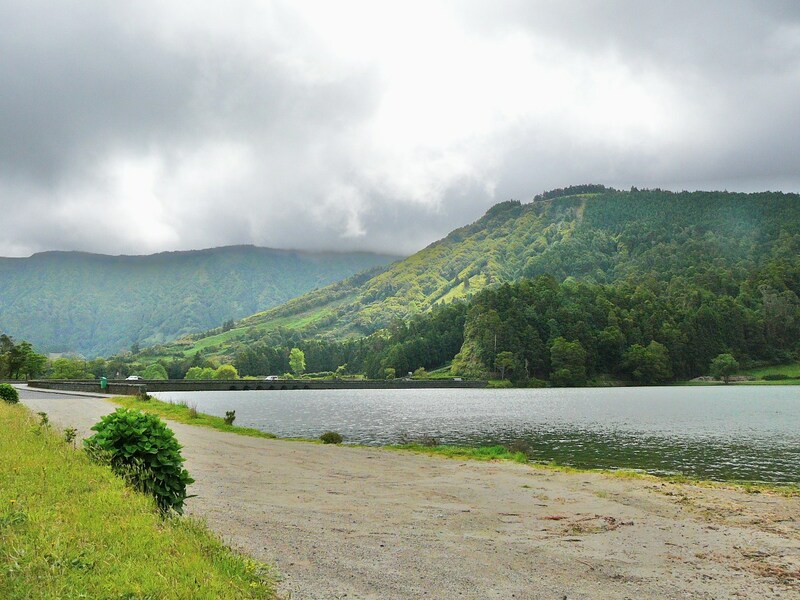 After seven days at sea, without even a sight of land , we arrive at Ponta Delgado, in the Azores. We are still in the middle of the Atlantic, 500 miles from Portugal, but the Island of San Miguel. is a welcome chance to be on dry land. 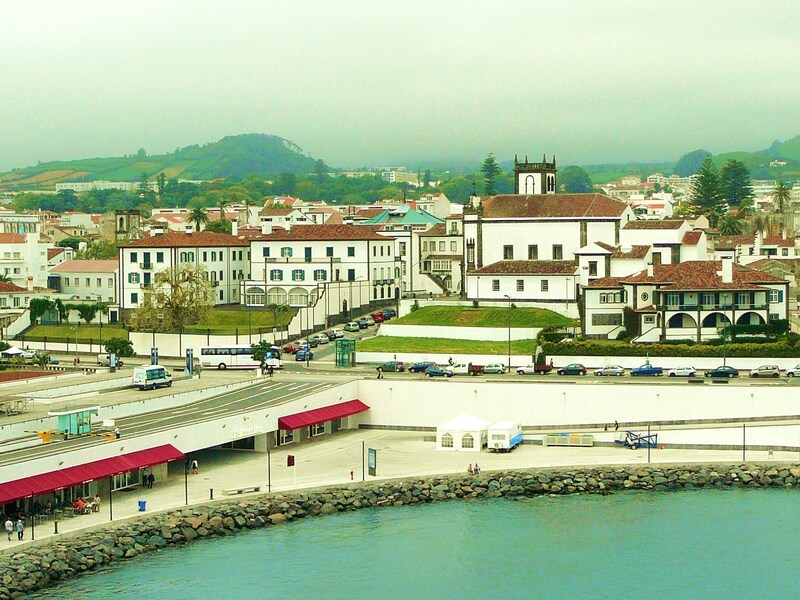 The town of Ponta Delagado has an attractive Promenade lined with 19th century buildings, and as we walk off the ship into the town we can’t help feeling that it reminds us of somewhere. The old town behind the sea front is full of narrow cobble streets with terraced stone houses adorned with wrought iron balconies. It is charming but with shades of faded glory. The volcanic stone comes from the large volcanic crater at one end of the island that now is home to two lakes, and it is there we set off for in our rental car. The island is beautiful, full of rich greens, a patchwork of small green fields marked out with old stone walls, trees of every description, bamboo, and flowers. Huge banks of flowers are everywhere you look. The sides of the narrow winding roads are beautifully manicured with banks of lilies, hydrangeas, gladioli and azaleas. But there is a price to pay for all this beauty, and that is rain and damp. We have to drive through thick mist and sudden downpours of rain to climb over the ridge of the crater and down to the lakes. The lakes are stunning with the steep sides of the crater falling into the lakes, crammed with trees, their branches bending downwards under the weight of the shroud of mist, huge droplets of water constantly dripping to the ground encouraging a lovely covering of moss below. Unmade roads circle the lakes with picnic tables scattered along the waters edge. Wherever there is an acre of level land, there are manicured lawns running down to the lake, carefully planted with azaleas. There are tiny hamlets with holiday cottages all boarded up with matching green shutters. And everywhere there are small colourful birds singing their welcome. It is stunning. But where does it remind us of? Is it the Lake District in England? We just can’t pinpoint it. Back at the town of Ponta Delgado we ask for an Internet Cafe, and when we enter it, we stop dead in our tracks. We look at each other in disbelief. We have been in this Cafe before. And then it comes to us. Ten years ago we did another Trans Atlantic Cruise, and we stopped here then. That’s why it’s all so familiar. This is the sign we have been waiting for. But Gordon says, he doesn’t mind. It feels like he wakes up with a different person in his bed every morning. Just when you thought this was degenerating into yet another travelogue, and just when we thought fabulosity was a thing of the past, a series of events rocketed us back into Patsy’s world. The fabulosity meter first came to life when we returned to the ship and found an envelope had been pushed under our stateroom door. It was an invitation to join the captain’s table the following night. Now, dear readers, you have to admit that is one giant step on the road back to fabulosity. However we had already accepted an invitation to an onboard birthday celebration for that night. We spent the next 24 hours trying to decide if we could possibly back out of the birthday celebration and accept the Captain’s invitation. But even I couldn’t be quite as crass as that, and it was with great regret that we turned the Captain down.. But no good deed goes unnoticed. Later that day we received word that the Entertainment Director would like to have drinks with us before dinner. Sue Denning is an English entertainer, who at a very young age used to sing with Merseyside Bands in England and Tamla Motown Groups in the USA. She is also a comedian and for the last 7 years has been working as an Entertainment Director on Cruise Ships. We had talked to her several times on board and enjoyed her company. The feeling was clearly mutual as we discovered that the the invitation was just for us. We sat with her in the Martini Bar, sipping cocktails and watching the Fabulosity meter clicking up another notch. It was at that moment that we were joined by A Turkish Gentleman in an Officers uniform. Sue introduced us to him as Niyazi, the Hotel Director. The big boss on board!. Sue told us that she had invited Niyazi to join us because she was sure he would enjoy our company. In the background we could hear the Fabulosity Meter trying to keep up with our meteoric rise. After an hour we had to leave for our birthday party, but not before Niyazi had told us of some wonderful clubs and restaurants that we had to visit in Istanbul (we will be there later on this trip), and promised to send a written list to our cabin. As we said our goodbyes, Sue said she had enjoyed the evening so much that she would like us to join her at the Captains table the following evening. There was no way we were turning this invite down! We joined the birthday dinner party in the restaurant, determined to be discreet about our newly found star status. But our plans of modesty, however false, where ruined when the head sommelier arrived at our table and presented Gordon and I with a very expensive bottle of red wine with the compliments of Niyazi. We were sure that the rest of the table could here the Fabulosity Meter clicking away. Dinner the next evening at the Captains Table was a formal affair, although it was not a formal night for the rest of the ship. So, as we walked to the Dining Room in our Dinner Jackets, several people stopped us to tell us we had made a mistake and that tonight was not a formal night. It was with a certain amount of thinly disguised pleasure that we were able to reply that it most certainly was when you sat at the Captain’s Table. The evening was a great success, and the repartee between Sue and us kept the table laughing all evening. At one point Sue was threatening to flick spoons of sorbet across the table at me. I happened to mention during the course of the evening that we hadn’t been served Fries (chips to you English) once during the entire trip. The head waiter happened to hear this and when desert was being served presented us with a plate of fries covered in chocolate sauce. Surely a first at the Captains table, causing the fabulosity meter to explode. You must be asking, dear readers, just as we are, why this sudden interest in yours truly has happened. We rather like number 3! While all this has been going one, we have also visited Lisbon (loved it, but has a serious homeless problem), Cadiz (REALLY loved it ) and Malaga (hated it). But it all seems to pale into insignificance compared to our fabulous life on board, so please forgive me for not mentioning it. Tomorrow we disembark in Barcelona, spend one day in that wonderful City before boarding another Cruise Ship. This time it is the Nautica, one of the Oceania Ships, and we head off to the Eastern Mediterranean. Oceania is our favourite Cruise Line and it should be a step up from Celebrity, but the last few days are going to be hard to beat. Sad you hated Malaga and sadder we did not know you were calling in there for a splendid lunch/dinner would have been give by us at home just forty mintes away! Never mind we will beat the fabulosity meter higher another time. We know your fabulous not matter what option but we would like to take credit for option 2!!! Bob & I were choked with your observation of Lisboa "homeless situation: What a wonderful city and great people.Sorry to hear it's present condition.Agree with you about Malaga.It all sounds wonderful days/nights. So glorious and splendid medicine for the sould with its great dinners/lunches.Keep enjoying it. I agree with Eric – we all started our online campaign to make sure you were recognized and treated as behooved your status! I sent the red hat photos from Dale and Arthur's party oh so many seasons ago – but still fabulous!